The General impression about the house and its owner is largely dependent on complement the interior of various decorative elements. One of them is the rug for the hallway. And since the entryway is what begins every apartment, attractive and aesthetically pleasing it looks, will depend on the impression of the whole house. Well-chosen rug can significantly transform the hall, and to accentuate the style of the house. Doormats can be very diverse: large and small, square and round, colorful and monochromatic. However, the main criterion of choosing a rug for the hallway is the material from which this decorative and incredibly useful element of the interior is made. Wool carpet for hallway perfectly absorbs moisture, is practically not crushed and not subjected to mechanical damage. If you regularly maintain and clean this carpet with all the rules of cleaning woolen clothes, he is able to last for much longer than any synthetic product. In addition, wool carpet for the hall is considered to be environmentally friendly and absolutely safe for health living in the house of people. The disadvantages of wool carpet in the hallway can be attributed to the propensity of this product to the accumulation of dust and its relatively high cost. The carpet in the hallway of synthetic materials resistant to mechanical damage, long time and maintains its original appeal, is easy to clean and is used for quite a long time. Due to the huge variety of colors, synthetic rugs for hallway you can always choose the most suitable for you and your home option. Perhaps the only drawback of the products of synthetic materials is their low resistance to direct sunlight. However, due to the fact that the hallways in most homes of our country have no Windows, the lack of synthetic mats can be called insignificant. 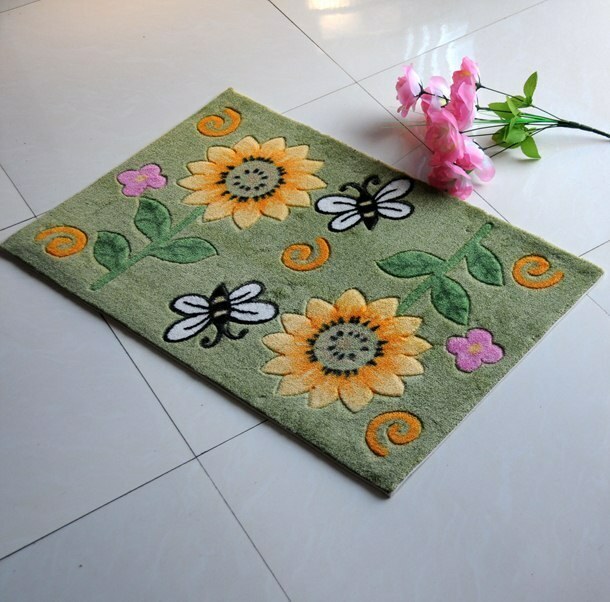 The most popular synthetic materials used in the manufacture of doormats are nylon and polypropylene. To choose a good carpet hallway is not so difficult. You can give preference to products corresponding to the General style of the apartment, or, conversely, buy a Mat that will be with the overall interior of the house is the original bright spot. Doormats with a long NAP quickly lose their appeal due to the formation on them the beaten track. Good rug for the hallway needs to not only play the role of a decorative element, but also to perform its main function, which consists in cleaning the soles of their shoes coming into the house of the people from street dirt, dust and moisture. Well cope with this task, lint-free doormats. If you've decided to decorate your home with a soft product, give preference to carpet with a short NAP. Be sure to pay attention to the quality of lint. Matted, hard and dry threads talking about the low quality of the product. Really nice rug for the hall is woven from soft and silky fibers.